Hydraulic coupling has many application in industrial machines and locomotives. They are used in mining, textile industries, oil and gas industries and other material handling industries. Fluid coupling can be used in very extreme condition like high engine vibration. The fluid utilized in the coupling can successfully absorb such vibration, so they are best for cyclic loading conditions. The fluid coupling can also act as a hydrodynamic break. Controlled start up speed without shock loading of power transmission system. 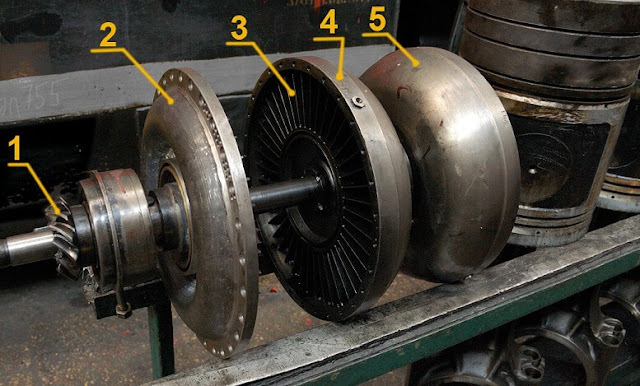 There is no mechanical contact between driving shaft and driven shaft (or between pump wheel and turbine wheel). Hence there is no frictional wearing of them. Power transmission is smooth. Motor or engine starts unloaded. Fluid coupling can dampen shock loads. Fluid coupling can run smoothly even in extreme conditions. The power transmission is free from vibration. There is no chance of vibration noises when power transmitted from vibrating engine to the driven shaft by using a fluid coupling. Fluid coupling can be used in both vertical and horizontal application. The maximum torque can be adjusted by varying the amount of oil filled in the casing. The fluid filled in casing must be compatible with coupling component, it directly affects the transmission behavior of the fluid coupling. Fluid coupling cannot develop torque when the driving shaft and driven shaft are rotating in same angular velocity. Under stalling condition, the coupling dissipates energy as heat it may lead to damage.